Sea Sessions headliners Dizzee Rascal, Walking On Cars and Rudimental will be joined at the biggest beach party weekend of the year by some of the best competitors on the international surf circuit, BMXers and Beach sports fanatics this June! Adding to an already stellar line-up of music acts, Sea Sessions has just announced details of their Barefoot Beach Sports sponsored by Barefoot Wines, SeaSessions Expression Sessions with thanks to Clean Coasts and the Sea Sessions BMX & Skate Jam. Having sold out weeks in advance over the last three years, Sea Sessions promises to be bigger and better than any year yet as festival organisers celebrate 10 years partying by the beach. With their unique blend of quality acts, beach sports, surfing and a stunning location right on Bundoran beach on the Wild Atlantic Way, Sea Sessions has evolved organically over the years and is much more than a music festival. Sea Sessions surfing and sports events have become an important kick off to the tourist season in Bundoran and have made Sea Sessionsan integral part of the Irish festival circuit. Winner of IMRO Festival of the year at the 2017 IMRO awards alongside picking up the gong for Festival of the year at the “Excellence in local Government Awards”, Sea Sessions has gone from strength to strength. Taking place Saturday 23rd June to Sunday 24th of June, the Barefoot Beach Sports will feature a Barefoot Colour Run around Rougey, Barefoot Volleyball, Barefoot Soccer and Barefoot Beach Tag Rugby. The Clean Coasts Surf Expression Session event is held on the iconic surf breaks of Bundoran on the Wild Atlantic Way over the course ofSea Sessions weekend and the Champion of champions event returns with a bang, and a €2500 prize, the biggest cash prize in Irish surfing. This years sees Reubyn Ash from the UK defend his title from past champions Liam Turner and Gearoid Turner. There’s also entrants from Europe and beyond. The Clean Coasts Surf Competition is just one of the many features that make Sea Sessions so unique. Top riders from around Europe will showcase their skills at the #2minutestreetclean BMX & Skate Jam. There’s an 8 foot quarter pipe which will host Bmx’rs from The UK and Skaters from all over Europe. Northern Irelands Parkour display team will also be showing off their skills too. Displays will happen on the hour every hour throughout the Festival. 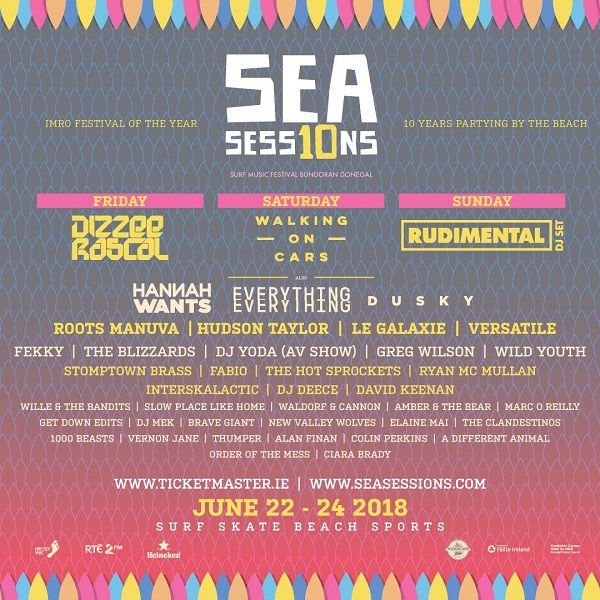 Sea Sessions 2018 festival lineup includes Dizzee Rascal, Walking On Cars, Rudimental, Everything Everything, Hannah Wants, Dusky, Delorentos, Chasing Abbey, Hudson Taylor, Le Galaxie, Jerry Fish, Kormac (Av Show), Fekky, The Blizzards, Versatile, DJ Yoda (AV Show), Wild Youth, Greg Wilson, Stomptown Brass, Fabio, Ryan Mc Mullan, The Hot Sprockets, DJ Deece, David Keenan, Wille & The Bandits, Slow Place Like Home, Waldorf & Cannon, Amber & The Bear, Marc O Reilly, Get Down Edits, DJ Mek, Brave Giant, New Valley Wolves, Elaine Mai, The Clandestinos, 1000 Beasts, Vernon Jane, Thumper, Alan Finan, Delta Fuse, Salty Sea Dogs, Bpm, Colin Perkins, A Different Animal, Order of The Mess and Ciara Brady. Over the years such luminaries as Tinie Tempah, Paul Wellar, Bastille, Seasick Steve and loads more have graced their unique stages. The Festival started way back in 2008 as an after party for a Surfing Competition. Now it holds the top Surfing Competition in the country as well as hosting the worlds top skateboarders, BMX’ers and loads of beach sports. Supported by and working with Donegal County Council and Failte Ireland the event has become an important kick start to the tourist season for the capital of Irish surfing in Bundoran. Early Bird tickets have now sold out but tickets are still available from all Ticketmaster outlets nationwide, www.ticketmaster.ie. Priced from €109.90 for 3 days and €134.90 including 4 nights camping. There’s also limited single day tickets available from €49.50, Surfer Bar (VIP) Upgrades from €50 extra plus Glamping options. Check www.seasessions.com for more details. 22nd – 24th June 2018.